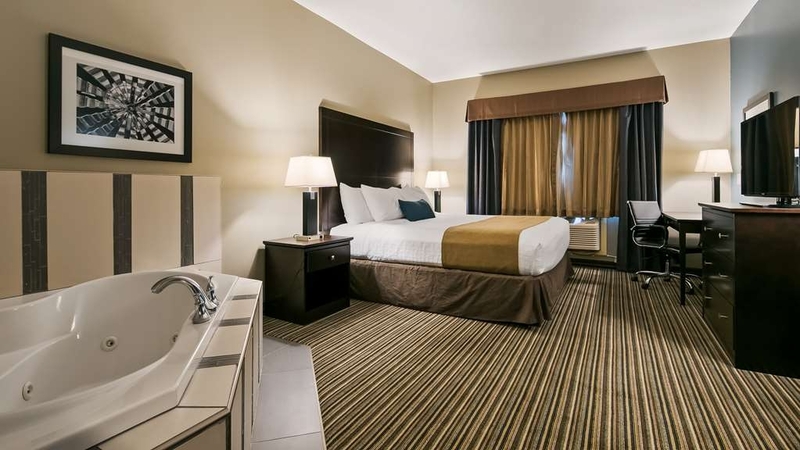 Il Best Western Plus Fort Saskatchewan Inn & Suites è situato nel centro di Fort Saskatchewan. L'hotel è vicino alle principali attrazioni turistiche. Approfittate tutto l'anno del miglior prezzo garantito e di offerte esclusive. Nel cuore del distretto industriale e ricreativo di Fort Saskatchewan, questo elegante hotel non fumatori da 100 camere offre la comodità di casa e un rapido accesso alle aziende e alle attrazioni della zona. Situato in Westpark Boulevard, a solo un isolato di distanza dall'autostrada 21. I centri commerciali South Fort Mall e Street Mall e discreti ristoranti sono a pochi minuti. Il Best Western Plus® Fort Saskatchewan Inn & Suites è in prossimità di numerose attrazioni locali. Fort Saskatchewan e la contea di Strathcona si trovano nel cuore industriale dello stato dell'Alberta, con la più grande area adibita alla raffinazione degli idrocarburi. Questa è una delle zone più interessanti del mondo, per chi è nel settore petrolchimico o della produzione di carburanti fossili. I viaggiatori d'affari troveranno nelle vicinanze alcune delle più grandi raffinerie di petrolio e dei complessi petrolchimici più importanti dell'America del Nord, compresi Imperial Oil, Suncor, Enbridge, Alberta Envirofuels, Dow Chemical e Shell. Gli ospiti dell'hotel apprezzeranno tutti i giorni una colazione all'americana giornaliera e avranno a disposizione il parcheggio gratuito, l'accesso cablato e wireless a Internet ad alta velocità e chiamate urbane gratuite. Rilassati e rinfrescati nella piscina con acqua salata e nell'idromassaggio, entrambi al coperto. Centro fitness e business center sono disponibili per i nostri ospiti sette giorni su sette. Le camere arredate con gusto dispongono di materassi con imbottitura a cuscino e tre strati di lenzuola, televisori LCD da 40 pollici, caffè in camera, microonde e minibar. Per la tua prossima visita a Fort Saskatchewan o Strathcona County, prenota oggi stesso al Best Western Plus Fort Saskatchewan Inn & Suites. Ti auguriamo un soggiorno gradevole! Always stay here when traveling for work. Great rooms, good service, friendly staff Close to restaurants. Always happy to stay here. Never disappoints. Breakfast has great selection with fresh fruit available. Thank you for sharing your feedback regarding your recent stay. We hope to see you again when you are in Fort Saskatchewan. Thank you once again for choosing our hotel. Booked for the jacuzzi room and weren't disappointed. Room was comfortable and clean, jacuzzi in room filled fast and comfortably fit two adults. Location is good, Boston Pizza shares a parking lot. Only suggestion is hotel staff mention to guests the restaurant gives a hotel key discount as we didn't know until after the fact. Breakfast was a highlight. I stay in a lot of hotels of this star level and hands down best options and quality that I've seen for a complimentary breakfast. Omlettes, non-dried fruit for the oatmeal, scrambled eggs and breakfast potatoes, and of the regular options a ton available. "Couldn't have asked for more! Highly recommended." Went to this hotel due to location of Grandchildrens home in Sherwood Park. The children totally enjoyed the pool hot tub and the fact there were two TV's in the room so they were able to watch tv or hook up the game controller Being to cold to venture out enabled them to be happy with the new Xmas gifts and the amenities of the hotel. Highly recommend. We were quite pleased with the room, pool. The booking through internet threw us off as it was more than presented. We contested against the breakfast not being there and the time and clerk called us liars! "Friendly Staff and Clean Accomadations with a nice breakfast." Stayed for one night. It was a last minute booking and when I called in the friendly staff was eager to help and offer a great rate. Ended up needing a late check out and we got it, no questions asked and no extra charge. It was an easy place to find and had a great stay! This hotel is well run and the staff most professional. For me, a frequent traveller the sleep I had for the four nights was probably the best in a long time. Hotel is well kept and the breakfast selection was great. I have stayed at this property before and definitely plan on returning in the next month as I have more business to conduct in the area. Staff is friendly, very comfortable:) Pool was great, and breakfast was one better ones we had:) for continental style options :) Gladly would stay here again ! The staff was friendly and kind, no issues at all! One of the best breakfasts around, lots of receptacles for electric devices, the room is clean and spacious, but that breakfast......... Fantastic! The service staff was friendly.I definitely recommend this hotel. Frequent visitor to Fort Saskatchewan. Tried a few other hotels, and I have found that this is the best one in the city. Clean, friendly staff and great location. Just a few steps out the front door you can find a grocer and drug store as well as several restaurants and pubs. "Always a great stay go above and beyond"
I stay here every two weeks visyv my son and his family.I never have had any issues they go above and beyond.Best customer service and clean safe rooms great internet food and parking.Pools gym all well maintained. We didn't get the room we reserved on the website. They didn't let us know that the pool and hot tube were out of order. We would of left if we knew. No towels in pool area after the freezing pools was tried to be swam in. Then it was like pulling teeth to try get towels. No bedding for pull out couch and had to get them ourselves same as the towels. No effort to try to make dissatisfactions better. Dear Garcia, Thank you for completing the survey regarding your recent stay at our property. On behalf of our entire team, I would like to apologize for not exceeding your expectations. Your satisfaction is important to us and we will be using the feedback you gave us to implement improvements to ensure we offer a better experience for guests in the future. I hope that you will consider staying with us again so that we can have another chance to provide you with a superior experience. "WELL PRICED, CONVENIENT & CLEAN"
This is a newer hotel in this sector of the "oil patch" and I enjoyed here. Hotel was convenient and rooms and facilities were well appointed and clean. Pricing was also lower than similar hotels and I will stay there again when I next visit this area. Breakfast starts at 05:30 which matters for those who start work at 07:00. Really nice room. It was clean and the bed was comfy. Odd shaped room but very spacious. I do believe I picked this hotel for the location as I was meeting my husband and this was perfectly in the middle for driving. The staff at this hotel are very attentive. On arrival the we were given room 103. I am not sure if this room is not regularly used as it was not as clean (floor) as I expected. This room is along a corridor that has a smell. The hotel staff were forthcoming that they are working on correcting this problem and graciously moved us to another room. The new room 434 was very good. We appreciated this prompt action. The rooms are well appointed although changing out the lighting to brighter (and cheaper to run) LED bulbs would be a major improvement as the rooms are somewhat dark. The kitchen equipped rooms have limited dishes and accessories, but the staff again accommodated us with what we required for an extended stay. Overall we enjoyed our stay with a good free breakfast, good laundry facilities and a very friendly staff. I would suggest that advertising the adjacent Frieson Brothers Grocery would be to the hotel's advantage. This is a lovely gem of a hotel. It is very spacious, clean and well maintained. I was very pleased with the comfort of the room. Breakfast was lovely and a pleasant surprise to see real scrambled eggs! The staff go out of their way to make your stay meet your expectations. I will definitely stay here again. "Great for family holidays or business travel"
Very impressed with this hotel. Almost don't want to give a good review because I don't want more people staying there which may make them too busy for my next trip! Rooms were quiet, A/C worked well, beds were comfy, breakfast had a great selection. Easy to find but just off the main road so not a lot of outside noise either. "Team Trip and the staff were awesome!" We had a late arriving youth sports team. The manager on duty took care of our check in. He was amazing and very accommodating. The hotel was fully booked and he was still able to shuffle a few rooms to meet our needs. "Clean, quiet, economical and comfortable"
We stayed here in the fall (we got stuck here due to snow along our planned route and everyone was most kind be helpful) as well as this trip and both times we were more than pleased with the service and the amenities. The bed and pillows were very comfortable without any scented laundry detergent I am pleased to say. This time I did our laundry here and was pleased with the cleanliness, price and the timing of the machines. I will recommend this hotel to our friends and will certainly stay here again when we are coming through. "Best Place We've Stayed for a Dance Competition"
The staff was extremely friendly, the room was huge and comfortable, the rate was excellent because we got given a discount for the dance competition even though we didn't book in advance, and the breakfast buffet was delicious. A waffle maker, real food including sausages and eggs, and even the biscuits were kept warm. We were also only 5 minutes from the dance competition which was very convenient. 10/10 would recommend. This hotel provided one of the best stays that we have had and we travel a lot. 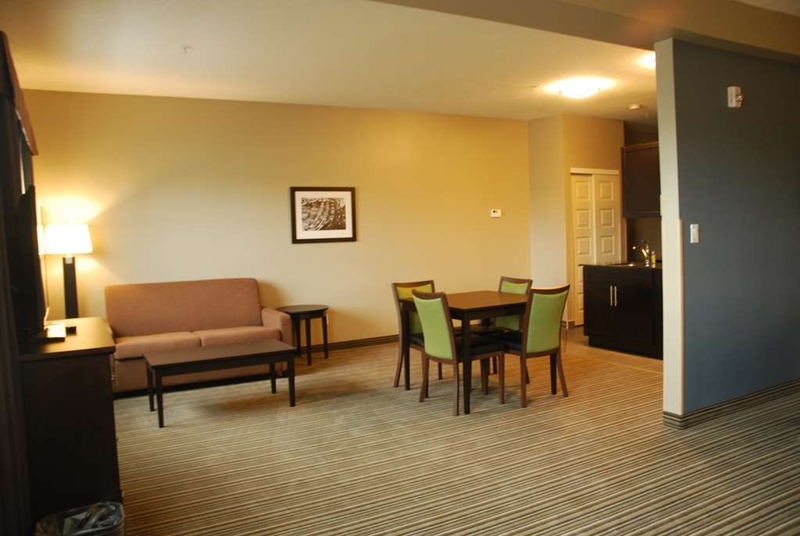 The hotel is very well maintained and easy to find if you are arriving from the Edmonton International Airport. We arrived very early and we were able to get our room well before the 3 p.m. check-in, which we were very grateful for. The room is the very spacious and provides a lot of comfort, especially if the relatives or friends want to visit in your room. The beds are very comfortable and the rooms are very quiet so no hallway noise. The free breakfast was amazing and the time frame that breakfast is available is great. This is a full on hot breakfast, self-serve and also includes some dinner items, there is definitely something for everyone, even picky eaters. The staff were amazing and a very special thank you to Ayesha who really made our stay special. Check-in and check-out is a breeze and there is zero negative that I can provide and a lot of ‘highly recommends' for this hotel. Our best stay ever, thank you to Best Western! Friendly helpful staff. We were visiting family just N of Edmonton so this was a good alternative to staying in the city.The hotel is newer and the rooms are nicely appointed and very clean. The beds and pillows were very comfortable. I keep the room fan on low and heard nothing all night. There is a garage/convenience store, a Shoppers Drug Mart and a nice restaurant (Sawmill) a short walk from the hotel. Side door is accessible with room key which is handy. Was in yown for a dance competition in Sherwood Park and this was the closest hotel with vacancy. Breakfast was great, pool nice temperature. Huge room, clean and very friendly staff. Had a lovely stay. I've stayed at 5 different locations with BW. At each location, the staff have been completely professional and caring of individual needs. The hotels themselves are top notch places to stay. Comfortable clean rooms & excellent breakfast options. "Overnight Stay - Jacuzzi Suite"
We stayed overnight at the Best Western Plus after attending a Christmas party. We were greeted promptly and check in was a breeze. We stayed in the jacuzzi suite on the main level. It was very quiet and the bed was comfortable. The jacuzzi tub was clean and worked great. We enjoyed the complimentary breakfast the next morning - they really do have something for everyone! Highly recommend this hotel for your next stay wether it's for work, school, family or sports. Very nice hotel. The room was very clean and the bed was really comfortable. The staff were freindly and helpful. The breakfast was good and lots of selection. ehe location was good. Close to restaurants, nightlife and shopping. "Great hotel for great value"
Excellent hotel. Breakfast had good quality and variation. Staff was friendly. Clean hotel. Very close to other restaurants and other amenities. Would recommend this hotel to all guests. Value for what you get is really good. "Best Western Plus earns it's +"
Over the past few months I have had to stay in holes in the Edmonton area. I chose not to stay in Fort Saskatchewan because of what I thought would be to much distance between conducting business and the hotel. I look back and wish that I had made the effort to stay with this hotel for all my previous stays in Edmonton. I am a very picky person and I inspect my hotel rooms prior to accepting them. The cleaning staff performed to a very high standard. The room was very clean. The bathroom, bathtub and floor were free of any stains, streaks or body hair. The linens in the bathroom were crisp white and stain free. This is where many hotels fail when I inspect the bedding. This hotel did not. The sheets were fresh. They were free of any kind stain or body hair. I admit I am very picky. This hotel room was kept a very high standard of cleanliness. The staff on duty were excellent. Any staff member I interacted with too pride in what they do. They projected that the customer IS their priority. The price of this hotel is also fantastic. Those are just my thoughts. I hope they help. We booked a room with our grandchildren on New Years Eve and Errol gave us a free upgrade to the executive suite!! That way our 2 and 4 year old grandchildren would have their own room. Amazing New Years Eve spent making memories!! I would recommend this hotel!!! This is a Great Hotel to stay at, the staff is friendly and the breakfast is good too. There is a pool which is nice for the children and an exercise room too. It is right across from Timmies & The Canadian Brew House. 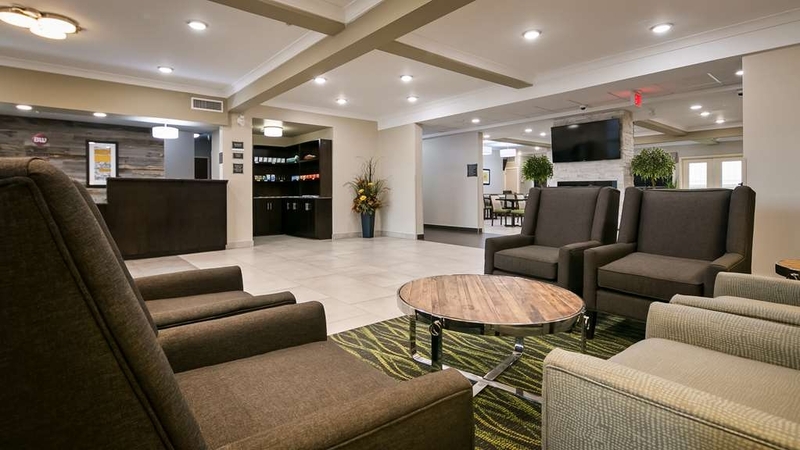 "Enjoy your stay in Fort Saskatchewan's Best Western Plus"
I travel extensively for work and this hotel was great to come back to at the end of a day. Friendly staff, big clean rooms, great fitness facility for a hotel and a breakfast that I looked forward to each morning. "nice but tub is just a catch basin for shower too shallow"
Rooms were very clean and tidy. Everything as it should be. Hotel was just off the main highway and close to our connections we needed to make.Breakfast started at 5am which is required in my case. Breakfast has a good variety of choices. Thanks for your kinds words and the time you took to share them with us. It is great to hear, that you have enjoyed your stay with us. Rest ensured, that we will take you comments for further improvement within the team to ensure personal service and warm welcome for your next visit. All the best and see you soon! next time give us infomation We give something for you. Warm regards Sean Park - General Manager. "Quiet, clean hotel with friendly staff." Thank you for being our guest and for your review! We're glad to see you enjoyed your stay and found your room quiet and comfortable. We hope to welcome you again soon. Staff was super helpful and friendly! Had a mix up with the crib we requested (it accidentally ended up in the next room) but they had it resolved within 10 minutes and even checked with us if the sheets in the crib were acceptable. Such great service! Breakfast was great! Room was very nice. Would definitely stay again! "Oct 2017 Best Western stay"
I give the management and staff a big thumbs up. I'd like to add that I've stayed here another 3 times at 4 nights each since the October stay. As a longer term resident, I would like to see a better band width internet. I had trouble streaming the SN oiler channel on my computer as well as net flicks. This is the 4th different B W hotel I've stayed in this year and the only one with this issue. I really don't have any other complaints. The staff is always courteous. Whether it's the front desk staff or the cleaning staff, you're always greeted as you pass by them. I definitely will be staying here through out my business here in the Fort and would recommend others business or pleasure to do so as well. Comfortable, clean and modern facilities. 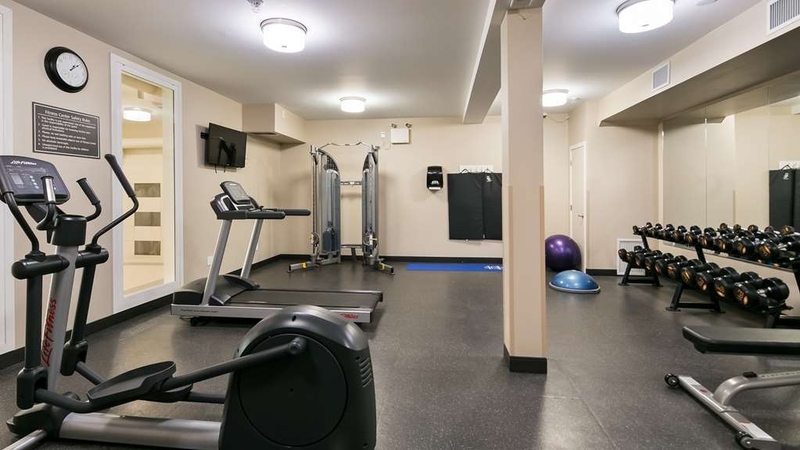 Well located to transportation and other amenities. No issues or concerns during the stay. Breakfast item were the standard fare normally seen. Express checkout was helpful. Staff provided allowance for extended checkout on request. Not the usual high standard I have experienced with Best Western. Bathtub wall had dried on soap or shampoo from previous occupant. Checkout customer service representative was only using one word answers such as "ya" and "um hum" Breakfast buffet was luke warm at best. "Great hotel close to Edmonton"
Excellent hotel close to the city but without the city noise. This hotel is very clean, comfortable and has very helpful staff. The breakfast provided a lot of choice. 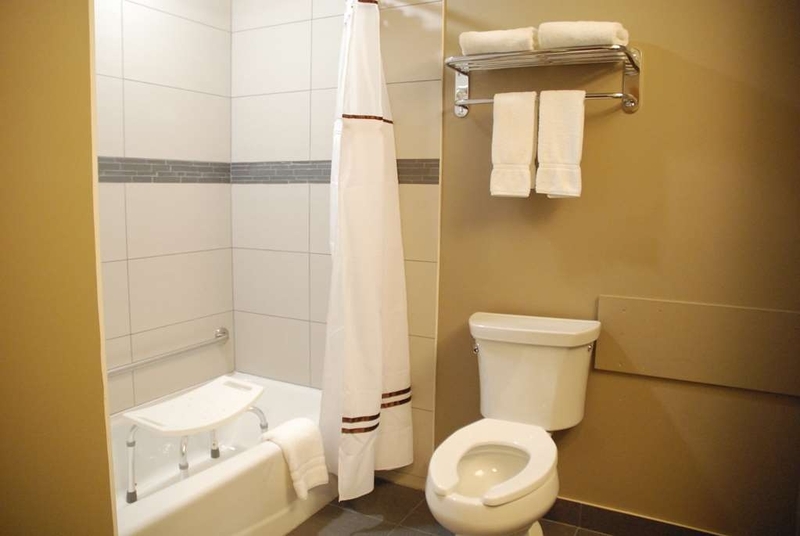 The amenities are very useful for those travelling for work as well as pleasure. "Pleasant stay for our big family!" Came to stay as a family for a birthday, loved the big room , pool and breakfast. Was clean and comfortable, had a kitchenette but no dishes , utensils or kitchen linens. A bit of a mix up with our reservation but helpful staff helped make us comfortable. Good value, would definitely recommend. "Excellent hotel, great value for price!" Stayed here for two nights in October. Staff were friendly and willing to accommodate any special requests. When the heater didn't work in our room they were quick to try and fix it and then offered us the same room on a different floor when it couldn't be fixed. Rooms were clean. Lots of selection in the continental breakfast. There is Keurig coffee available 24/7 in the lobby! Huge perk. 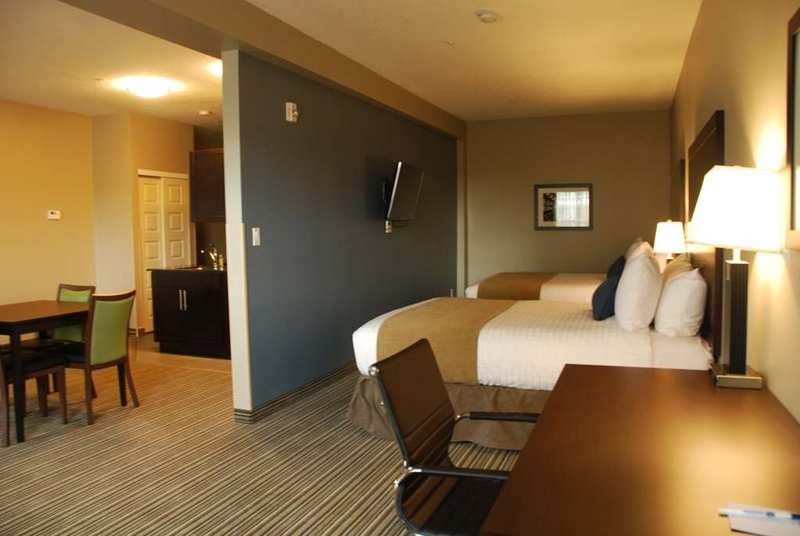 "BEST HOTEL IN Fort SASK "Hands down""
This hotel has excellent features in addition to good rooms and helpful staff. 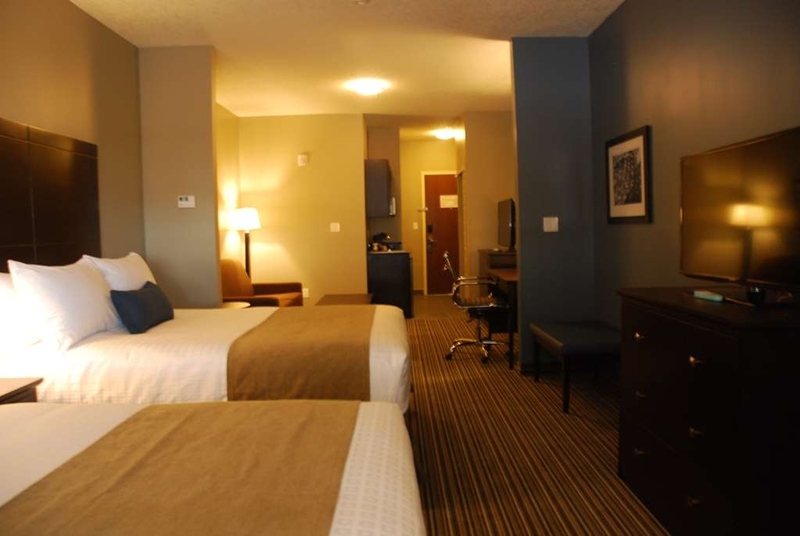 The hotel is well situated for road access to all of the Capital Region and is easy to get in and out of. There is ample parking for trucks and SUV's. I would definitely recommend this hotel for value for money. You definatly want to stay here if looking for the best hotel around the area. From them having the best staff around to the clean room and great breakfast... well dont think about where to stay. This is your best choice around! Very nice hotel at the outskirts of town close to Tim's and nice walks. It is a new property and has a great breakfast. You will enjoy your stay. Five minutes to downtown or you can walk or bike along the river. "Great experience for the family"
Great experience, was able to call afterwards and follow up on the reservation- friendly staff at check in. Very clean, organized, well maintained building. Lots of places within walking distance - Tim Hortons right out front. 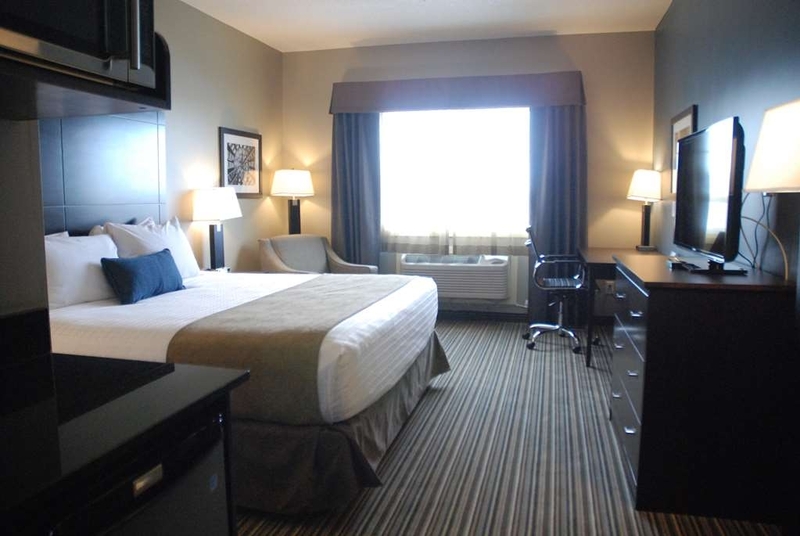 "Great place to stay in Fort Saskatchewan"
We had reserved 2 rooms for 7 nights. First off I must say that we found Errol and Ayesha at the front desk, and the young man and woman who looked after us at breakfast, as well as the housekeeping staff to be professional and indeed very friendly and polite. The rooms were very clean and modern, and beds very comfortable. Because of hotel location, the traffic noise was non-existent, ensuring we slept peacefully. The only complaint we have is the use of air freshener in the elevators and some hallways. It was way too over-powering, and really not necessary. Located within spitting distance is Tim Horton's, Wendy's, as well as Great Canadian Brewhouse. Shoppers Drug Mart is located across the parking lot, and Husky gas station is in the other direction. Across the road is a small strip mall which has a bakery, pizza restaurant, florist, etc. Montana's BBQ and Bar is a 2 minute drive away. Walmart is less than a 5 minute drive away. We would absolutely stay here again on future trips to the area. "Extremely Good Hotel for the Price"
The exterior of the building appeared to be low cost construction (artificial rock/brick facade) but well constructed. I was very pleased with the selection and quality of coffees and tea provided. The beds and cleanliness were excellent. My only complaint (but very minor) is that the room lights were all individually controlled, with no master control requiring a lot of wandering around to shut things off when when I went to retire. "great bed, best pillows ever, clean and comfortable"
Excellent staff customer service is excellent. Staff members very friendly. Excellent pool and hot tub and dry sauna. Hotel is well kept and well maintained. Breakfast is provided and his a hot breakfast. Had a great experience here! All staff we encountered were excellent and super helpful. Room was very clean and comfortable. Breakfast was pretty good for continental. I would definitely recommend this hotel and we will definitely be staying again! We stayed here while meeting friends who were passing through camping. Excellent service, friendly staff, spotlessly clean, excellent breakfast buffet - such a relaxing stay. Most definitely will stay there again if we ever find the need to be in the Fort Sk area! "Best service possible clean and comfy"
I am a repeat customer have stayed at this property dozens of times. Always welcomed with smiles. The property is located near many places to eat and shop. Free parking Wi-Fi free cookies when you check on too. Very nice modern rooms clean always spotless. The pool and hot tub great place to relax. Well lit halls quite rooms. I have nothing neg to say. We love staying here it is in a great location with two restaurants & a gas station in the same location, the rooms are clean and comfortable, the staff is helpful & friendly plus you get a free breakfast! 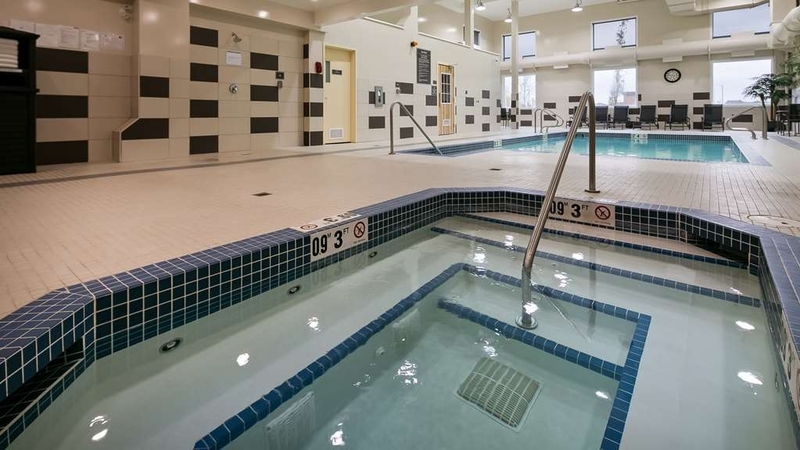 "Great price for great sevice"
"The only place I stay while in Fort Saskatchewan"
This facility is excellent. Free parking, high speed wifi, breakfast and printing in the business centre. 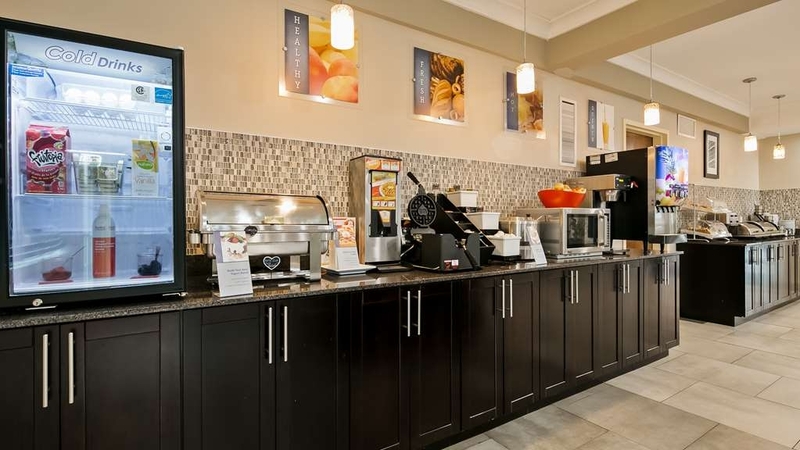 The higher end hotels cost more and charge for everyone of those items Best Western Fort Saskatchewan provides at no cost. The staff are great, rooms are spacious, clean and comfortable. "Stay was more than we expected from the hotel." Stay was wonderful. Queen size beds were so comfortable. Room was very clean and roomy. Breakfast was tasty and a very good selection. Above all the staff was SO SO FRIENDLY. We would definitely stay at a Best Western again. the rooms were excellent.. the beds .. wonderful... the morning breakfast is excellent... waffles.. pancakes.. buns and toast.. scrambled eggs.. another egg dish... excellent sausages,,, potatoes.. bacon... juices of all kinds.. lots of cereal.. hot & cold.. boil eggs.. they make their own cookies there... coffee everywhere... from your room to the lobby and breakfast room.. lots of tables... this is the best I ever had.. we do travel and this was great.. got a excellent price on name your own price on priceline.. $78.00+ taxes .. the end of june 2017... other than the pool was cool .. the hot tub was hot.. I would give it a 9.9 of ten..... I have not stayed in a better hotel.. staff was excellent..
Decided to take a room rather than drive early in the morning. Unless roads are in poor condition I will drive next time. Room was clean, good enough but no hotel seems to meet that same home feeling. "Ask for a room with curtains that close." The hotel is fairly new and in good condition. Poor quality building materials, but for now it still feels fresh. The beds are comfortable, and clean. Our room didnt have curtains that drew closed so the sun woke us up bright and early. Also had a very hard time finding someone at the front desk after 10pm. "Squeezing every dime from us." The place was ok. Our relatives all rented for the weekend. Still wanted $13 before they would send my forgotten E-Readed cord. Never again staying there. NO CUSTOMER SKILLS. We stay with Best Western all the time. REALLY turned me off that after spending thousands they still wanted more. Excellent and very accommodating. The room was spotless and I love the microwave and mini fridge....the pillows well the are next to none....I don't like big pillows but most do and hey would love them...the pool was great and hot tub was awesome...I love them.... the breakfast offer was great but I was mixed up on the times and missed it on the one day I could of used it...but that was my fault...we will most definitely will be staying with yous again..thank you for the enjoyable stay! 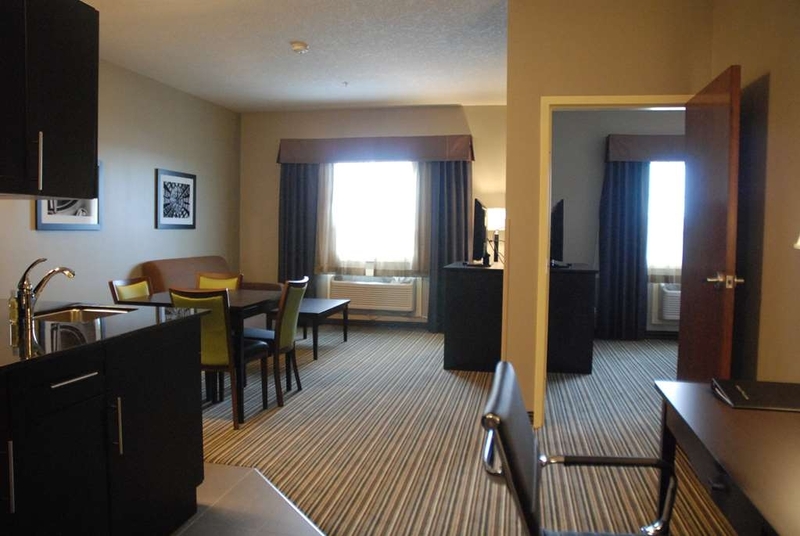 I spend a fair amount of time at soccer tournaments in Sherwood Park and I find staying at the hotel in Fort Saskatchewan is worth travelling that few extra kilometres to stay at. It is nice a quiet and clean and the staff is wonderful! Clean, comfortable,rooms. Location is convientant . Full breakfast menu. Parking was excellent at hotel. This hotel also has an electric vechile charging station across from the entrance to rhe hotel. Shopping and restaurants with in a short walk. "Best hotel in Fort Saskatewan"
Pleasant stay, no outside room noise and great location. Great sports bar located next door with a good food selection, as well Tim Hortons next to the hotel. Suites are ample and comfortable. Pool, hot tub and sauna are clean and to expectation from the BW brand. Clean, quiet, great service and close to a good selection of Restaurants and bar. Great for business travel and very easy to find. The staff are amazing and always make sure that I have a great stay I always try to stay at this BW when in Fort Saskatchewan. I would recommend staying at the Fort Sask Best Western to anyone very clean rooms,helpful staff, great breakfast. You will not be disappointed. The staff go out of their way to make sure your stay is comfortable and you are happy with your room and comfortable. If you are returning to the area for any reason they will give you the best rate possible. We enjoyed our stay here in April for our daughters dance competition. The staff were all very friendly and polite. The hotel it's self was clean and well maintained. Our room was comfortable and clean! Breakfast was included and it was alright. The kids enjoyed playing in the pool and the staff was kind enough to put the hockey game on in the lobby for all the parents who wanted to watch. We would certainly stay here again! Pool a bit small but was very clean and enjoyed it and the hot tub. Service was great. Rooms clean. Was quiet, even though there was a dance festival going on in town that weekend and many of the dancers stayed at the hotel. Rooms were clean, beds were very comfortable and the staff was fantastic. Would stay at this motel again. I recommend this place. Staff are friendly & helpful. The rooms are nice/clean with comfortable beds. There is also a pool here with a hot tub/sauna/steam room. They also offer a Full Breakfast and is good. The room was very clean and nicely set up with planets of amenities and space. I drove out of my way to stay at my favorite brand of hotel and I was not disappointed. The hotel should put more staff on for busy weekend breakfast times. The food was very good and excellent quality. "Nice hotel with great value"
This is a very nice hotel for a reasonable price. I stayed in a Standard king room. It had lots of room in a very comfortable bed, and that's the most important part of a hotel room. Good selection for hot breakfast included with the room. Weight room, swimming pool and hot tub. Right next to a couple of restaurants, car wash, gas station, morning coffee stop. This is my second time staying there and I will stay there again. "Friendly staff, and cleanliness is always welcoming"
Earl at the front desk goes above and beyond to accommodate and ensure your stay is enjoyable. It is always nice to see his welcoming smile. He will follow up with a phone call to ensure there are no issues. Thank you for staying with us. We are grad to hear that you have a great time with Errol who is front office manager. We look forward to see you next time. "Amazing hotel great rooms and staff." I have become a regular at this hotel over last year . I get a great rate clean very elegant room comfy bed pillows great hot breakfast pool gym sauna. You can't go wrong close to restaurants and malls great parking too. The staff and owners are great people . 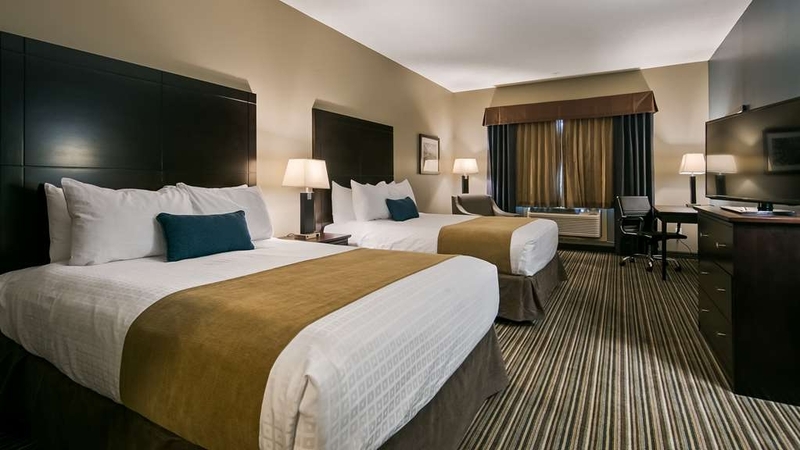 This hotel is located a short 10-12 minute drive from Sherwood Park but the cost savings is dramatic. The facility is very nice (New in 2015). I would strongly recommend this hotel. The hot breakfast is a welcome treat and when factored into the price you are getting a great room at a great price. Added bonus, there is a Tim Hortons across the street and a Canadian Brew House restaurant right next door. This hotel is tucked away within the most scenic town. It was very comfortable and the heating system in our room functioned well. Housekeeping was very efficient and respected our belongings. However the breakfast was awful!! We left th hotel to go to a nearby Tim Hortons instead. My advice would be to just book th room excluding what the hotel deems as 'breakfast'. Tim Hortons is literally 2 mins away. Also there are nearby restaurants and a pharmacy within walking distance. We stayed here on a thanksgiving visit to my family. The location is out of town but is in the centre of a commercial district on the highway so it is easy to get to and close to several restaurants from fast food to a steakhouse. There are other shops and service close by. The parking is free. The check in was quick, friendly and efficient. The lobby was clean and modern. Our room was a regular room but was roomier than most similar type accomodations I have stayed at. Not huge but plenty of room to walk around. There was a fridge and microwave. A major plus here was that the room fridge was quiet. Many times I've had to unplug a cheap room fridge because it sounded like an outboard motor. Also, the bed was comfortable and the room was quiet. I slept well all three nights. The wifi was free and had moderate speed. The room was clean when we arrived and was kept clean during a three night stay. There is a free breakfast that was not fancy but was a cut above what you usually get. It had eggs, bacon, sausages, and potatoes along with the normal muffins, toast and make it yourself waffles. It was definitely enough to get you started in the morning. There were a couple of minor glitches, room keys that didn't work on the third day and the wifi password didn't work on the second day. Both were taking care of quickly. The check out was fast and convenient. This is a great reliable hotel. It was clean, modern, and comfortable. The staff was friendly and efficient. This is now my go to hotel for this regioin. 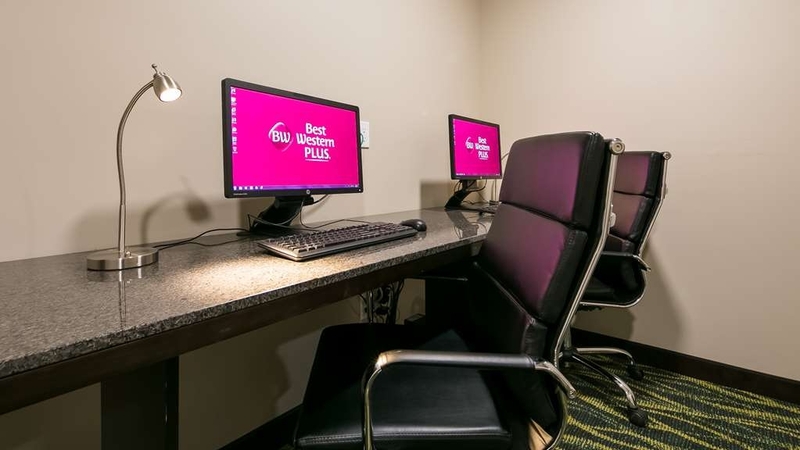 I have really come to appreciate the Best Western Plus hotels. I find them consistently clean and well cared for. The Fort Saskatchewan location is pretty new so very clean and tidy. The staff was friendly and attentive. The pool was appreciated as well as the hot tub. Some of us used the gym and said it was good....NO not me. I am a yoga girl. I like that the beds are most often QUEEN size as there are 2 to a bed. Very good value considering your breakfast is included and slightly above average continental. Good Stay!!!!!! Best service is what you are going to get from the staff here . Great location , restaurants next door like Canadian Brewhouse , Wendy's , Ollies Pizza etc... Rooms are clean , spacious , well designed and comfy beds . Self serve laundry works great , good breakfast and great coffee ! 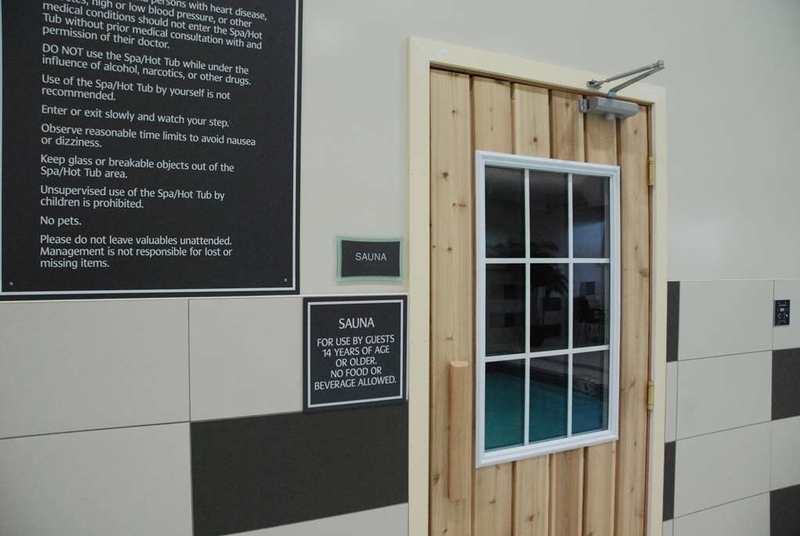 Pool , hot tub and an exercise room also are good extras . Can't go wrong here . This is the 3rd time we stayed at this Best Western in less then a year and absolutely love going back to it. We know the staff are always friendly and the room's are clean and comfortable beds make for a good nights rest. "Absolute Best Hotel I've Ever Stayed At"
My family has stayed at a lot of hotels, but this is the BEST hotel we have ever stayed at. 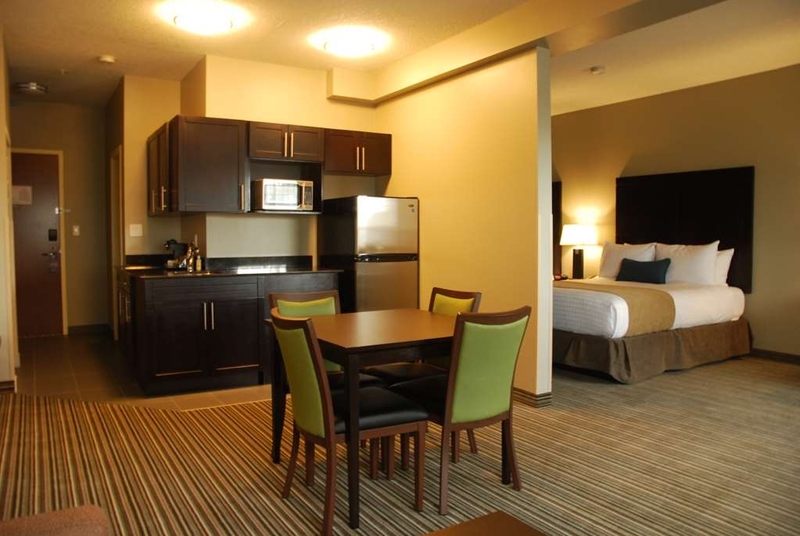 We were in Fort Saskatchewan for a dance competition and booked the 2 room suite at this hotel. The suite was huge with a full kitchen, large dining table and living room. It was perfect for our family. It was also very clean when we checked in, possibly the cleanest hotel room that I've ever stayed in. The staff was amazing and super friendly. We were so happy with all the staff and how friendly and helpful they were. We don't have many reasons to return to Fort Saskatchewan, but if we did, we would absolutely stay here again. This is the only place to consider staying in the area. Newly constructed, spacious, finely appointed. Amazing staff! Great pool! Perfect for business or family. Highly recommend this property. Great access to highway and restaurants. Good for Northwest Upgrader employees as it is near one of the company bus pick ups. I have a Diamond member status and on the road several weeks of each year always staying at a Best Western hotel when there is one in the town I am staying at. The BW in Fort Saskatchewan is fast becoming one of my favourite hotels to stay at. Clean (although it is quite new) and the rooms are quite spacious. Staff are very professional and the breakfast has had wide choice of items. "New Hotel in Excellent Location"
Brand new hotel is conveniently located on Highway 21 with very easy access to Highway 15. There is a new strip mall with a few restaraunts and services that are conveniently located walking distance from the hotel. Great pricing on a new product in the area. I would highly recommend this hotel. Errol was very courteous and polite on check in and check out. The young lady in the breakfast area remembered us from our last visit. I can honestly say it is very nice to have such a clean room. Stayed here one night for a wedding. Staff was friendly at the front desk and very accommodating for all of us wedding guests. Biggest highlight was definitely the room, very clean and modern with lots of space. Can honestly say it was one of the most comfortable hotel beds I've slept on. Didn't get a chance to try the breakfast or use the facilities, but I never heard any complaints. Definitely worth the money, would recommend for a large group or a wedding. "Best Hotel for all of your needs!" Gorgeous new exceptionally clean hotel in easy access location. Caring friendly staff. Very nice pool/sauna/hot tub. State of the art fitness centre. Large rooms with very comfortable beds. Great hotel for business or personal trips. Great for families. I would not even consider staying anywhere else. Great value! We enjoyed the Fort Saskatchewan Inn & Suites very much. We found the room very large and spacious which enabled us to entertain our son and daughter in law along with our first granddaughter as this was the first time we had seen her since she was born 2mths ago. Bed gave us a perfect night's sleep which was well deserved after travelling hours on the road. Breakfast as usual was delicious we always know we can count on BW for all the comforts of home away from home. Excellent facility. Only about 8 months old. Very nice modern facility. Excellent lighting in hallways. Great location - about 20 minutes east of Edmonton AB with great access to Edmonton without having to stay on Edmonton. Very quiet around the hotel which made for agreat sleep. "Wonderful 2 night stay... highly recommend!!!" We chose this hotel for our two night stay based on Tripadvisor reviews, and we certainly weren't disappointed. Check-in was a breeze with lovely friendly staff, and we were given a very nice king bed suite on the 4th floor which was spacious and clean. This is practically a new hotel and it's very well maintained. There's an indoor pool and spa (and sauna which we didn't use) and the area is spotless and very nicely appointed. 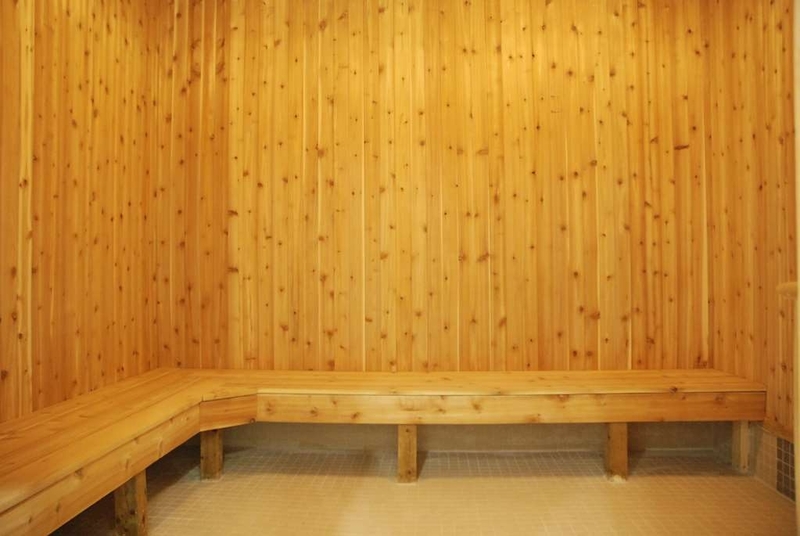 There's also a well appointed fitness room with towels supplied. As we were travelling we made use of the guest laundry and it too was spotlessly clean and in good order. We enjoyed the best sleep here, with a super comfy bed, efficient air conditioner and lovely quiet room. In-room coffee is also pretty darn good... unusual! Breakfast was included in our very affordable rate and it was exceptionally good with everything you could possibly want on offer i.e., juices, coffees, teas, hot chocolate, yoghurts, fresh fruit, muffins, bagels, toast, oatmeal, cereals, waffles, brekky burritos, hash browns, bacon, sausage and scrambled eggs. 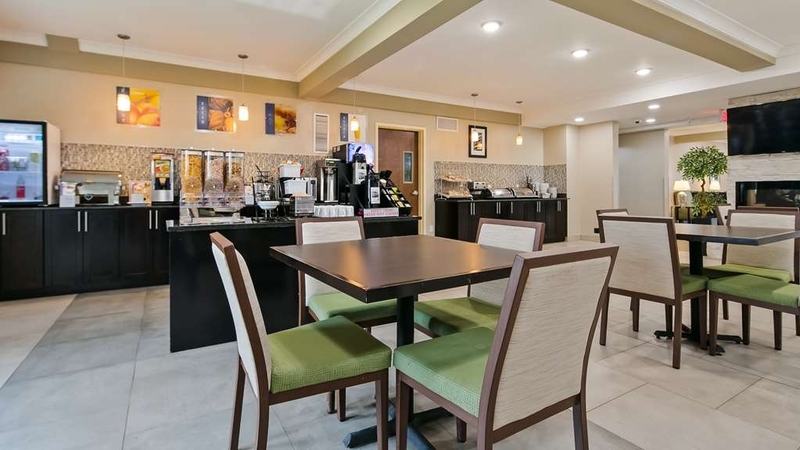 Breakfast is served in a lovely clean dining area right next to the foyer with big screen TV's so you can watch morning news etc while you enjoy your meal. The area was very neat with the server (sorry I didn't catch her name) constantly tidying and cleaning to ensure everything was perfect for the next guest. This hotel is situated opposite the Sawmill Restaurant which we visited for dinner and Tim Hortons and Wendy's are next door... so if you are after more traditional dining experience you can visit Sawmill and grab a quick meal from either Wendy's or Tim Hortons if you prefer. Very convenient. I have no hesitation in recommending this exceptional hotel and will definitely visit again if we're in lovely Fort Saskatchewan. Once you stay in a hotel they all kind of become the same. Well at least it seems that way with the newer Best Western hotels. Very clean, very nice staff. The only not great thing was the breakfast but you can't expect a ton when you have a continental breaky. Worst case scenario you walk a couple hundred yards across the parking lot to Tim Hortons for breakfast. Absolutely wonderful staff caring, kind and attentive, room was very nice, although the lighting was to dim; if I had been there staying for work purposes it would have been a problem. And the challenges with the water was a cause for concern one evening no cold and the next day hot water was hard to find. New structure they are working out the bugs :-). Over all because of the staff I will recommend others and will be back myself! Where can I start.... Myself and my 3 kids had to flee Fort McMurray during the BEAST fire destruction. My husband had to stay behind to help with the evacuees that went North to stay in camps so it was just myself and my kids. We arrived at 9:30 am on Wednesday morning after a 10 hour drive exhausted, in shock and completely devastated. The kindest young man name Errol was behind the desk and he was a godsend to us. He was kind, helpful and his sweet and just a kind sympathetic smile was what I needed when I was ready to crumble. He helped us get a room, accommodated us way more than what was required and I honestly dont know what I would have done if I had a different encounter as I was ready to completely fall apart. We stayed for a week and a half and all the staff was amazing but Errol was a shining star in such a dark dismal time. I needed that kindness at that time and I will never forget it. Thank you Best Western Plus for hiring people that is beyond exceptional, and Errol is beyond Exceptional. This hotel and it's staff are beyond exceptional. There is no comparison in cleanliness, amenities and value. You will not find a friendlier more helpful group anywhere. This hotel is immaculate, beautiful and very comfortable. Posh decor with very large rooms and plush flooring. I highly recommend this hotel. You will not be disappointed whether you are travelling for business or as a family. Great stay for everyone! "Nice and New and Friendly"
Great new place. Great staff, great breakfast, great wifi. Errol was great and was able to check us in a bit early so we could rest and get my son to his hockey camp. Awesome to have a Tim Hortons and restaurants next door. I would recommend the place highly and would stay there again. "New Hotel in the Fort"
This is a new and busy hotel. I found every thing was clean and comfortable and the staff were friendly. Would definitely stay here again when in the area. There are also lots of restaurant options nearby. "Fort Saskatchewan AB Best Western"
Very nice hotel. Very friendly staff. The gentleman at the service counter was especially friendly and helpful.The entire hotel and parking lot and landscaping was excellent. I will definitely stay here on my future visits. I recommend this hotel very highly. Stayed here for business, this is a newer hotel that is in great shape. When I stayed it was not busy at all, found some of the breakfast items a little old but still good. The rooms are very nice and the staff is great as well. There is a pub in the same parking lot which is a nice perk. The whole room was clean & beds are comfy. Room temperature was easy to handle & understandable. Bathroom is spacious. Staff are polite & welcoming. Pool/sauna/hot tub were good. Also a good location, close to stores, but also quiet. I'd recommend this place. My husband, son and I stayed at this hotel the nights of March 16 and 17/16. We had a lovely room and the beds were very comfortable. Generally we bring our own pillows if travelling by vehicle. This time we took them back to the van after the first night as the hotel's pillows were very good and there were lots of them. The people handling registration and other front desk responsibilities were excellent, particularly Errol and Allan.Errol gave us shopping tips and directions to nearby Sherwood Park. He told us the best way to avoid the construction at the East side of Edmonton. Alan was on duty when we arrived and he gave us all kinds of information about Best Western's promotions and how to access them.Breakfast is included and was one of the best we have had at a hotel. My guys were very happy to find both bacon and sausages available along with waffles, eggs, toast, bagels, apples, oranges, bananas, muffins, yogurt, four kinds of juice, decaf and regular coffee, toast, hot oatmeal, cold cereals and even hot soup.Breakfast was served from 5 AM to 9 AM so we had to be quick to get dressed and go to the dining room so we did not miss breakfast. This was not a problem for us and certainly accommodated the construction workers at the hotel who started work at 6 AM. The hotel was very quiet and clean. It was opened October 2015 and is in excellent condition. One minor issue was a lack of a third set of towels as there was three of us and towels for two provided. A request to the front desk both mornings quickly got us the third set of towels. I expect these kinds of problems will be ironed out before long as the hotel does seem to have a focus on customer service. We were in town for a dance competition. The beds were amazing. They let us have an extended check - out time so the kids could use the pool. The rooms are spacious and very well kept. The service was great and the breakfast was vast. There was something for everyone. The pool was clean as well as the elevators. 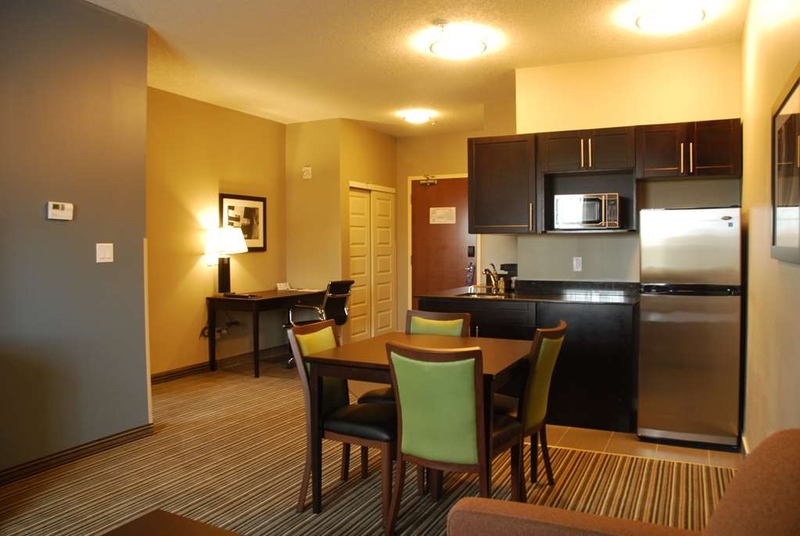 We traveled to Fort Saskatchewan for medical travel in December and chose this new hotel. Our first room was on the 4th floor and started out to be very acceptable. We left for the day and upon our return we found that the door to our room was left open and there was spray foam insulation protruding from the door. This was the case for all the rooms on that floor. Luckily, there was nothing missing. Our laptop and IPad, all our medications and personal belongings were at the disposal of whoever. When we notified the front desk, the young man was very apologetic and had no idea of any work being done on the rooms as it was a Sunday. He moved us to another room on the main floor. By this time it was almost midnight and we had to be at the Mazinkowski Heat Institute in Edmonton early the next morning. When we tried to sleep we were kept awake from the constant hum of the elevator next to us. Again, we asked to be moved and the friendly young man at the front desk was very accommodating. However, the manager was in the building and not once did he approach us. In fact him and his wife walked right by us as we were hauling our stuff to the new room and they never even gave us a smile or an apology. When we arrived back at the hotel after a long day at the hospital, we were gifted with a box of chocolates and a pretty towel dove on our bed. We also had an apology letter from the hotel, but it was not personally signed by management. The noise in this establishment left us with little sleep. Not only from the elevator noise, but from the housekeeping staff starting at 6 AM, but on the ground level we had noise from the nearby parking lots and highway traffic. "Nicest hotel in this area. 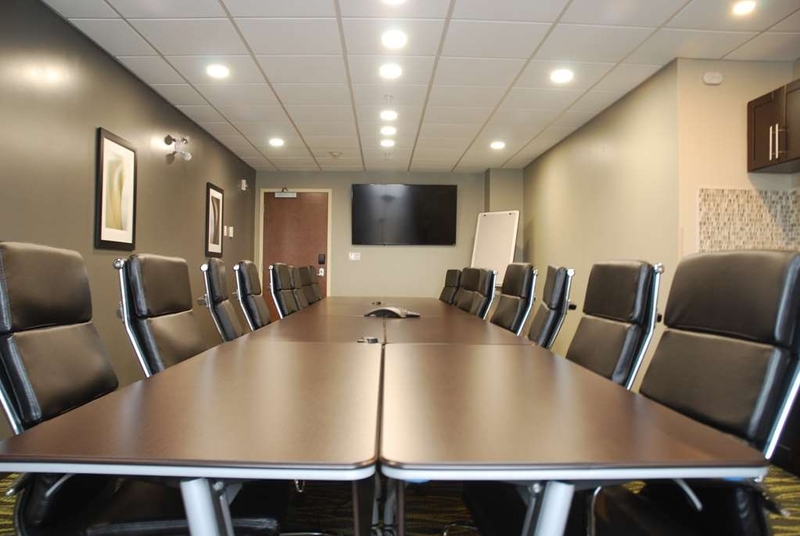 Great Value, friendly staff"
Beautifully appointed exceptionally large rooms. Great wifi, with clean, well maintained pool, sauna and hot tub. State of the art fitness centre. Great hotel for families or business travellers. Very comfortable and exceptionally clean. The staff are amazing and take care of anything you need promptly! Excellent manager and all staff that we encountered. Pleasant and helpful. Rooms clean, comfortable. Breakfast great. For a quiet restful place to stay, this is it. Close by are excellent restaurants and /or bars. This hotel is one with staff that cares about your stay. I wanted coffee when I arrived- the lady working at the front desk made me a fresh pot. A piece from my coffee machine was missing in my room- she brought a different one up right away. There was a problem with my bill- and they solved the issue (very promptly I will add, and I feel bad that I was upset because the staff here are amazing) when we realized that something was wrong. They go out of their way to make your stay as comfortable as possible (even when you're picky, like me). Stay here! Breakfast was beautiful and the rooms are very clean and spacious, I love the open concept in the lobby. Also, the pool looks so nice, I will use it the next time I stay. "New favourite hotel in The Fort"
Great rooms, staff is awesome, breakfast was super and the coffee is better than Timmies! Small pool and not deep but kids can still swim in it. It was our first time staying at this chain but will definitely be back. "Lovely New Hotel with Great Amenities"
We had a lovely weekend at the hotel. The breakfast was lovely. We enjoyed the hot tub and pool. The staff were all very friendly and helpful. The location is great with its proximity to shopping and restaurants. It is worth a drive from the city, due the ample free parking. We would definitely stay here again. "Wonderful New Hotel Very Modern and Comfortable Feel"
We loved our stay at this hotel. We got the King-size bed option in a suite and the room was extremely clean and comfortable. The internet was super speedy, the breakfast food was high quality (except for the bacon), but there was a wonderful selection and it was super tasty. The pool is in a huge, bright room and the hot tub is great. As well, the employees were extremely eager to please and made our stay go from awesome to spectacular. Would definitely stay here again and strongly recommend it to anyone interested. "Beautiful new hotel, large spacious rooms and friendly staff! Would stay again!" We would absolutely stay here again - The rooms are HUGE and nicely decorated. The staff was very friendly and helpful. Hot breakfast is included. The hotel is conveniently located next to a few different restaurants. "Very friendly staff and great rooms"
I stayed this last month for a night and I have also stayed earlier this year for a few nights. The staff are extremely friendly, quick to help, rooms are spacious and comfortable. Hotel is quiet and they have a really good breakfast bar. Exceptional quality with an unbeatable price. Large, luxurious rooms with all amenities such as desk, fridge. Great pool, hot tub, gym and daily continental breakfast. Great location with easy access to restaurants and shopping wishing walking distance. Great for business travellers. 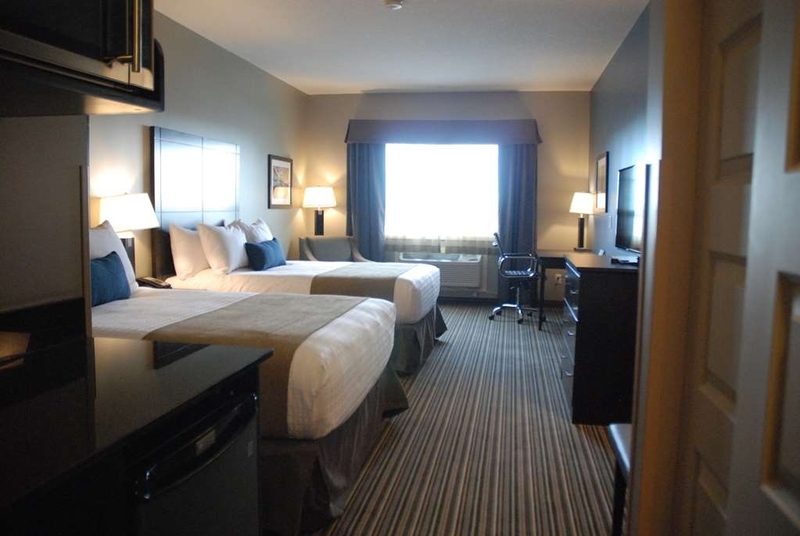 "Wonderful new hotel in Fort Saskatchewan"
Great place to stay with very courteous staff. Our room was very nice and spacious. Hours for breakfast were longer than most places we have stayed which made it easy for us to enjoy our breakfast before getting on with our day. I would highly recommend this hotel. As soon as we came at 11am the lady at front got my room ready quick and offered me coffee . Rooms were clean and the breakfast was really good . Parking was bit less had to park but far . The water slide was really good my kids loved it . Will stay again on our next visit to Edmonton. Just opened, this hotel will do well. Very nice rooms, good location - off the highway a bit so nice and quiet - a Tim's next door, and best of all a decent restaurant (Sawmill) about a blocks walk away. Nice pool and well equipped exercise room. Standard BW type breakfast well presented (no plastic cutlery here!!) and with an attentive attendant. Certainly a step up from the cluster of hotels on the other end of town. We were upgraded to a large suite with a King bed! Very spacious and bright. Great promo right now brings the cost down well below what we would expect to pay for the quality of this property! Should be a welcome addition to present hotel options in Ft. Saskatchewan. "Very Nice Property Just North of Edmonton"
Very nice property! A bit of construction on either side of it, but it was clean, bright, and seemingly new. Nice recreation facilities if they are working. If you are looking for a quality hot breakfast, however, plan to eat elsewhere. "Best experience we ever had"
We booked our room for one night and with the awesome treatment we were given we ended up staying for an additional 2 more nights. I would highly recommend this business. Loved the fact that breakfast was included and they went the extra step of using real cutlery and plates. "Huge rooms and Friendly service"
This Inn has only been open for a week, but the staff and Management are very professional and try to cater to any needs you may have, in a very courteous manner. Close to shopping, restaurants, etc. Highly recommend ! New hotel and staff was great. Close to all restaurants new and old and on back lot behind Timmy's for all you Timmy lovers. Nice pool area and Fitness center. Would definitely stay there again. Breakfast was a little blah but other than that good. The hotel is brand new, very clean (free of drywall dust) and the staff are very caring. I was there the first day and they were very accommodating even though they are still getting set up. I will definitely be back!